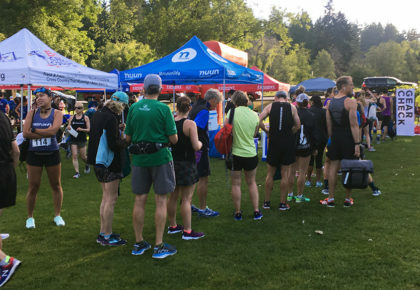 August 24, 2018 – The Michelob Ultra Night Run 5K/10K took place on a smokey Friday evening, beginning at the Stanley Park Pavilion. As one of Vancouver’s most unique running events, it took place after dark, with the course well-lit, and runners all provided with headlamps, for a nocturnal fitness extravaganza. The majority of the run was along the Seawall, with cuts in and out of the paths through the old growth forest, and by the Aquarium. The Night Run was an event geared more towards fun than competition, and this was reflected in both the course and pace of the groups. It was a little cold running along the Seawall at night, especially as some of the pesky fog from the previous few weeks began clearing for one of the colder nights of August. That didn’t take away from the course itself, which was packed with both great scenery and energy. While the world-class scenery, home to several runs throughout Vancouver’s race season, was spectacular as ever, the darkness and presence of lights on the course drew you away from the natural environment, and into the party atmosphere curated by the event organizers. So while the incredible mountain/ocean vistas of Stanley Park were a little obscured, everyone participating understood that the unique nature of the event was worth giving up the views for one evening. This was possibly the most exciting race atmosphere I have ever been a part of. From the vibrant lights leading us around the course, to the enthusiasm of organizers and participants alike, to the post-race beer and food festivities, the Night Run was more of a party than a workout. With stops all across Canada, this is definitely an event to tell the runners in your friends and family about. With the possibility of chaos that was created by having hundreds of people running through dark forests, event organizers did a great job of ensuring peace and safety for everyone involved. The excellency of the organization actually created the beautiful ambience of the run, with the lights serving a dual purpose of both illumination and inspiration.